Magnetic Catches are available at Ironmongery Experts. This is a practical and precise method to ensure that any doors or drawers, for either commercial or domestic use, are always held closed. These neat designs are sure to make your house or work place look clean and tidy. All our products come with a solid white catching mechanism. 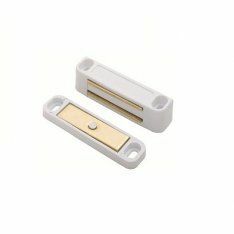 We have single designs such as the White Heavy Magnetic Catch as well as a dual structure like the White Double Magnetic Catch. Both Catches are made with high quality material and are guaranteed to be long lasting. To ensure outside structures like gates and garden sheds are properly secured, we have a range of Cabin Hooks. It’s important to have a safe and practical method to store gardening equipment and summer furniture as well as ensuring they are easily accessible at all times. We also have Indicator Bolts for rooms that require privacy. Both at home or work, there are always areas that need the necessary precautions. Our solid and stylish designs are ideal for toilets at either homes or offices. You can choose from a traditional engraved worded design or a red and green coloured style. Ironmongery Experts also have a strong selection of Escutcheons to add a quality touch to keyholes. Your front door will stand proud with one of our classy and dynamic designs, leaving your front door looking tidy and polished will ensure you’re always radiating the right impression for visitors. To add some style and vibrancy to your household, check out our list of Cupboard Knobs and Handles. These fun and funky designs offer an exciting and practical method to open doors and drawers. Our products are sure to be a hit with the kids as well, they’ll love our Cebi Joy Cabinet Knob design.